What a strange name for a quilt! 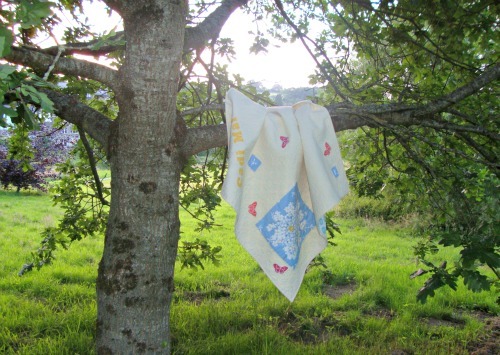 It's a direct translation from one of the Welsh names for a butterfly - 'Iar Fach yr Haf' (another name being 'Pili Pala') and as I think it's a cute name for a quilt it's what Cadi's quilt shall be named from now on. Yes I actually got around to writing a proper 'finished!' 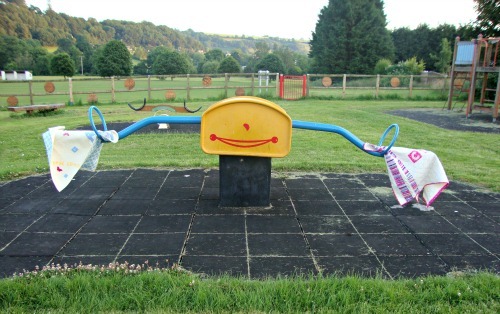 post for this one. 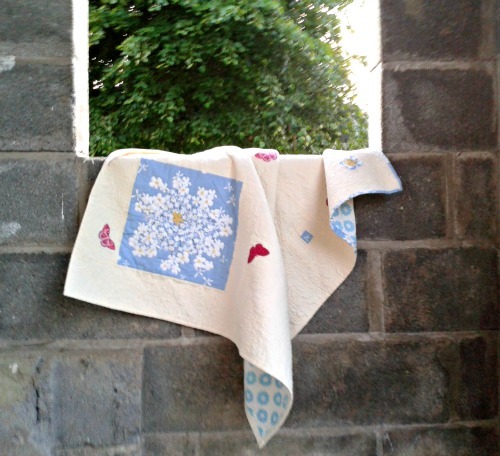 Last time I wrote properly about Summer's Little Hen I'd gotten as far as starting the quilting but didn't like the way that it was going and decided that me and Mr Seam Ripper were going to spend some time together. It didn't take long, only around twenty minutes as I hadn't gone too far with the straight line quilting. I decided that it was time to bite the bullet and try my hand at some free motion quilting. Now I hadn't done any FMQ before. None. I had originally planned to practice some FMQing on a quilt for myself made out of thrifted shirts but I didn't have the time, Cadi's been around for around a month now and if I wasn't careful she'd be getting this quilt on her first birthday! I started on the large square of Madrona Road and tried outlining the flowers. It went quite well and (for the most part) I managed to keep my stitch length pretty even. I then outlined the central yellow flower and then did a squiggly spiral radiating from that point. 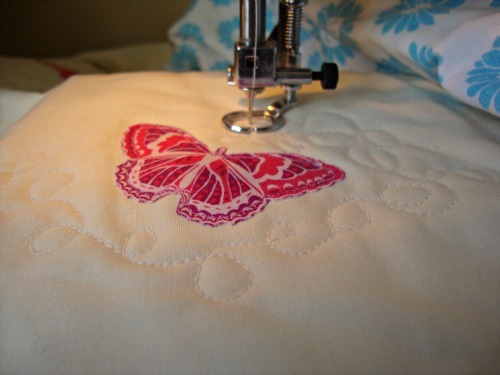 Looking at the pictures now I'm not really happy with this and am very close to getting Mr Seam Ripper out again but this quilt has got it's binding on so I'm going to stop myself. Then the fun started. 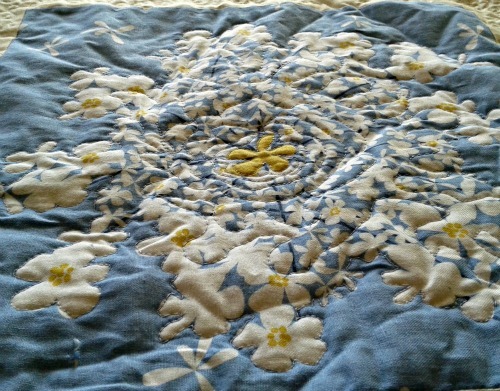 I decided to try a loopy design, keeping the quilting quite 'loose' as I didn't want the quilt to get too stiff. 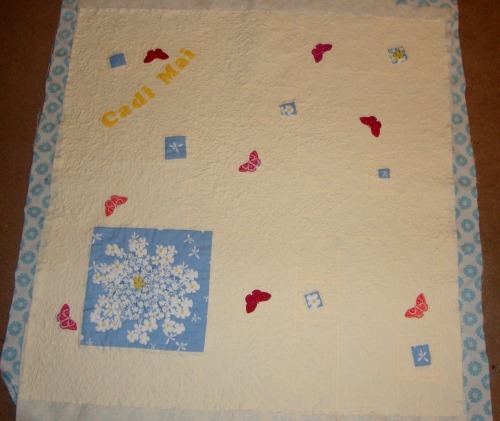 I decided to only quilt the negative space in an attempt to let the butterflies, 'petal squares' and Cadi's Name stand out a little. It went quite well and I was enjoying myself but I was having trouble moving the quilt around - it felt as if the throat space on my machine was waaaay to small. I ran out of thread so had to leave it there until I could get some more. Whilst waiting for the opportunity to get some more thread something that had been niggling me really began to bug me. In a big way. Whilst hand sewing I've always had a problem with keeping my stitch length even. You'd think that they'd get steadily longer but no with me the stitches get smaller and smaller and smaller. It looks like this problem has spread to my free motion quilting. If you look at the picture above you can see that as I quilted from left to right my quilting gets denser and denser and denser. I really did want to keep the quilting quite loose but was there were less stitches on the 'loose' side than on the 'dense' side I decided to unpick the loose side. I did it in batches and, in all, I reckon it took me just over three hours! That's a long time. And there was a lot of swearing involved. 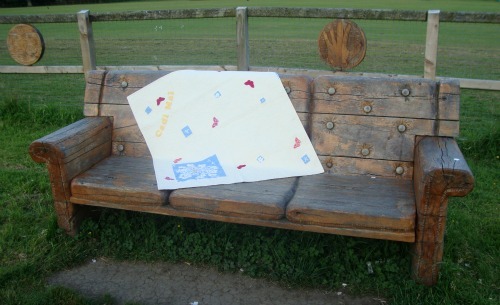 But overall I'm glad that I did it, I'm a lot happier with the finished article now. As soon as I'd managed to get some more thread (and I made sure that I got plenty - you can never have enough thread can you?) I set about finishing the quilting. It took me a few hours split into around four sessions over two days. And I took another picture in the middle of the night! The following night was the last day in June and I had set this quilt as my June finish for A Lovely Year of Finishes' and even though it was already quite late I decided that I should (just about) be able to get the binding on before the linky party deadline. I kept the binding very simple, using the same cream fabric as the quilt top with a scrap of Madrona Road on the corner opposite the large square. And even though Marged (who always sleeps through) decided that it would be fun to join Mam on the sofa for an hour or two I managed to get it finished, take a quick photo on the patio in the beautiful dawn light and write the quickest of posts to add to the linky (with around two hours to spare). Now in that post I promised a proper 'finished!' post and now, twelve days later. here it is. I learn't quite a lot whilst making this quilt. 2. Stand back and judge your quilting as often as possible. The more often you judge, the less stitches you have to unpick! 4. Buy thread in bulk - you can never have too much thread and running out is just a plain old pain in the arse. I also learned lots of other little things but most importantly I enjoyed making this little quilt. So much so I took it down to the village park for a little photo shoot! You can't really make out the river in the background in this picture so.. I went back down last night and took another one - don't I live in a beautiful part of the world? And lastly my favourite! 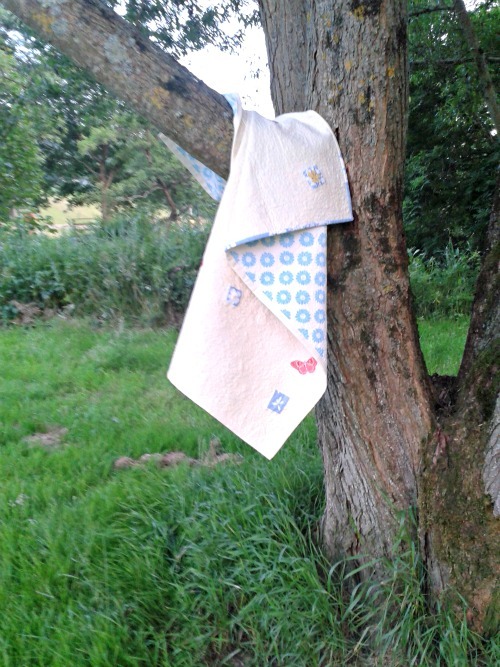 On the was home from my mum's last night I passed something that I pass every time I go there and hadn't thought of it as a quilt prop before. Light bulb moment! I put the car in reverse and came up with this. Isn't it cute? And just so British? I've come back as I've just realised that I forgot to show a picture of the back and I forgot to include the quilt stats! 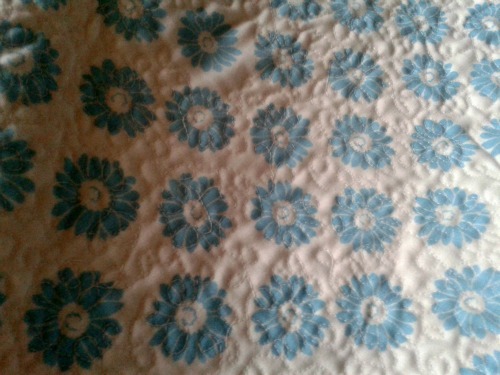 I love this vintage sheet I just wish that I had more that a few meagre scraps left! 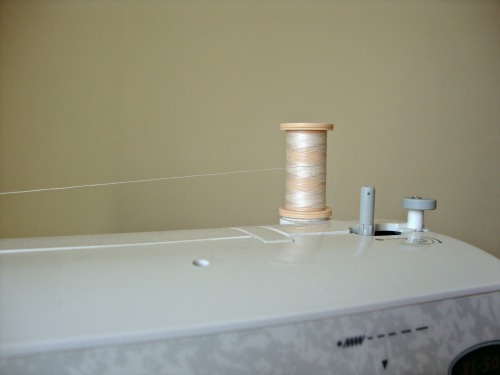 Thread: Coats 100% Cotton in 1212, an old spool of Dorma thread in a pale blue and Coats Moon 100% polyester in white in the bobbin. I really admire your determination, unpicking it to get it just the way you want it - it's such an awful job. It's a lovely quilt! Way to go, Catrin! 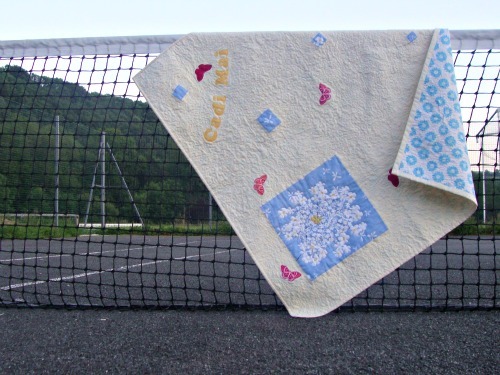 Great job with the quilt and the FMQ! It looks beautiful! Love the photos too. I'm a big sucker for those phone booths. I wish we had them here. Thanks for linking up to TGIFF! 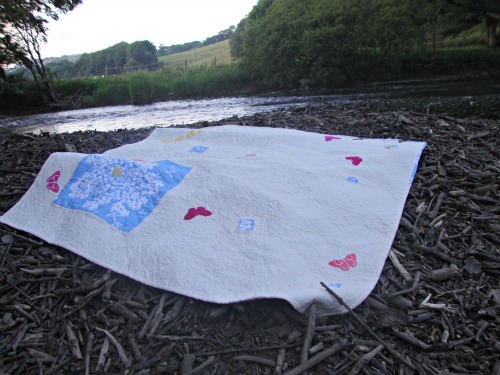 Loving all your glorious photos of your lovely quilt......AND.......such a cute, cute name!! I admire your patience too! 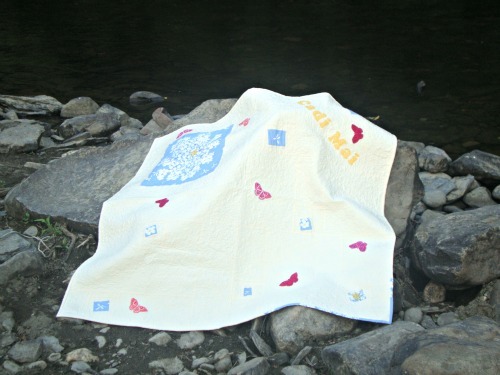 Hey, way to go with your first FMQ!! 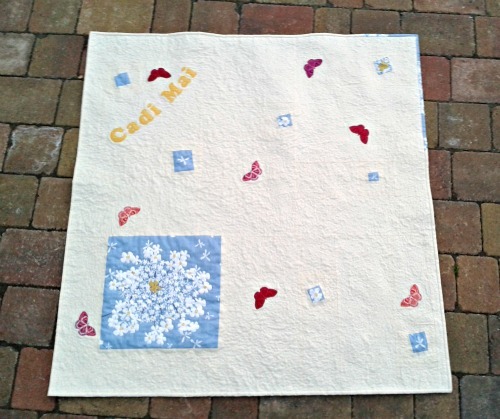 It's such a lovely baby quilt - who cares if the name's placement is off a bit - too much to love to even notice that at all. :D Love the bit of opposing Madrona in the opposite corner of the binding. I am impressed at your patience in picking out that much quilting. Some things are worth the time, though, eh? 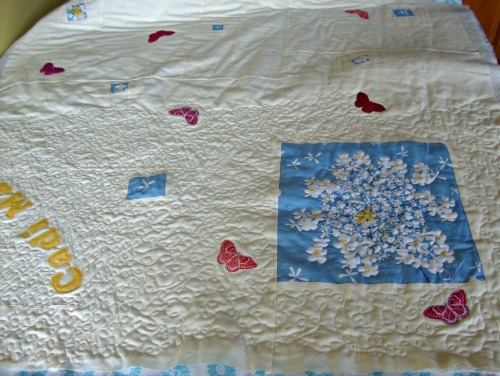 I used to have a lot of trouble with getting smaller and smaller with my quilting, too. It's a hazzard of table-top FMQ where we just can't see as much of the overall picture while we're working as a longarmer can see. What helps me tremendously is to find a common everyday object to keep in mind as a mental sizing gauge for my FMQ work. For example, I just finished a series of loops in star points, and I kept them pretty even in size over the whole quilt and across 4 separate quilting sessions by keeping the image of a pumpkin seed in my mind. Worked great! What a lovely quilt! 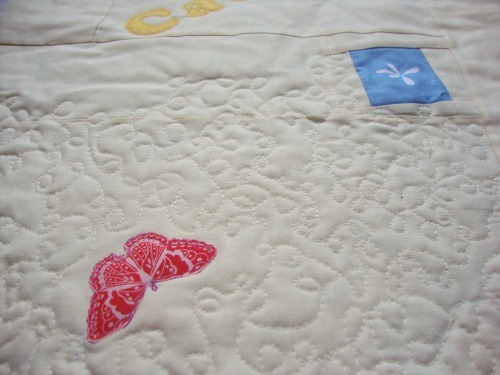 My finish this week was also a butterfly quilt :) Great photos too! Love the pictures! Especially the phone booth! 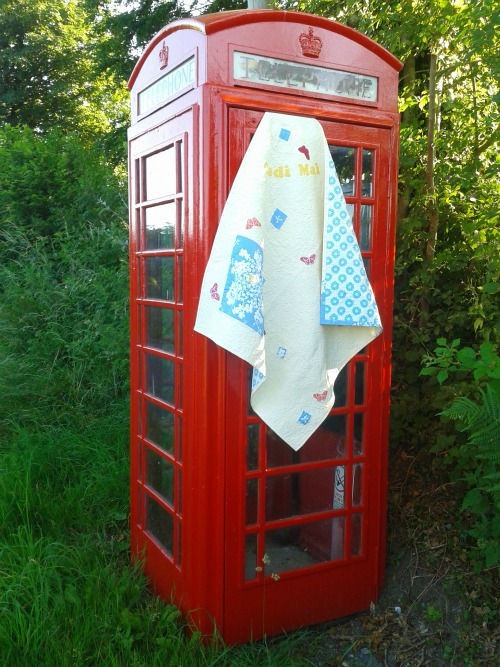 You do live in a beautiful colorful country, I like the photo on the wooden bench and phone booth, I almost have as much fun doing photo shoots as I do making the quilts.